I sent out the letter for February and the moment my sister read it she sent me an email, “buy the yarn”, was all she said. That is how I found myself selecting a pattern and chatting with the lady in the local yarn store. Our little town called Fish Hoek, has a neighbourhood mall, just down the street from the high school. All the stores face out into a courtyard of sorts. The anchor is shared between the hardware and grocery store. Then there is a laundromat, a ladies fashion store, a postal outlet, the yarn/craft store, a pizza place, a used book store, a cafe, etc. My whole life could be spent between this amazing views home and the little mall, everything I need is down there. From what I can remember of the little town in Devon, Alberta, where I grew up in Canada, life was similar. There were little, independent shops, owned and operated by people from the community. The big box and chain stores were not part of our life. We went to Florida pizza and everything was freshly made on site. If you had take-away, although why would you, it never tasted like cardboard. All the character stores, I guess you could call them that, in our home town of White Rock are slowly being pushed out. The rents are too high and young people probably have their sights set on something better than owning and operating a little shop. It is too bad, because something is lost when everything starts to look the same. Not to mention that all the different little quirks of a locally owned and operated store are gone. Those folks interact with their customers. They evolve their business to meet local demand and changing tastes. They get to know and befriend their neighbours and become a central figure in the community. One day, I would like to have one of these little shops. I don’t know if I could ever afford the rent, so maybe my place will have to sell a little bit of everything. A curio shop. I need a liquor license, a cappuccino maker, a machine to make fresh juice. I’ll have imported olive oil and parma ham. Expensive Italian lace and wool from Argentina. As well as everything locally made too. New and used books tucked into every corner. My seating arrangement could host a book club, a family dinner or a knitting night. Or an event with all three activities. Wouldn’t that be lovely? 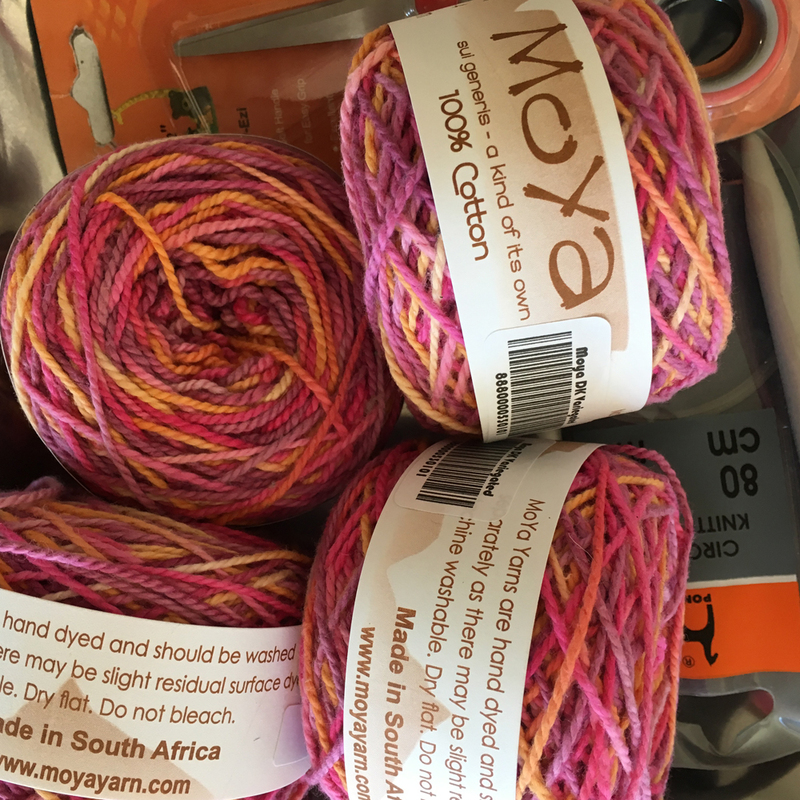 One of the women in the yarn store today commented that, “there is a difference between buying yarn and buying yarn to knit something.” If you are not a knitter you will not understand this. There is something magical that happens when you go into a yarn store. It feels like there are a whole bunch of babies calling out to take them home with you. It really feels like that. Stephanie has likely written that in one of her books. The yarn in your house is called ‘the stash’. As we are travelling around the world, I cannot manage the space or the weight to carry a ‘stash’ around with me. So I was only buying for a project. A justification to myself for buying anything at all. It is not to say I won’t go back one more time before we send a fed-ex box home. Who said I needed to carry my stash with me? It is accumulating at home, ready and waiting for my return. So there is about to be a project, started. My new needles are standing at the ready. I know the yarn colour seems bright, but I am making something easy and breezy and fun. I don’t care if it is a little over the top as well. It is time to be done with boring, solid, conservative colours. Unlike Stephanie, my projects take a long time to complete. With that kind of investment, the end result needs to make me smile. Thank God you bought the needles! I have been fretting ever since you told us you sent your set home! Enjoy! Yes, but I needed that time to concentrate, so it all worked out. I also sent home my amazing flight head pillow because we did not expect to do these overnight long hauls….had to buy another one in Hong Kong! The yarn colour is fabulous! I love it! Yes, it would suit you as well! Isn’t it fun to be bright? Love this post. I love your idea for a little store and if you want to add a little bakery , I will be the baker. That would be so awesome. I’m going to write up a little plan for our store…stay tuned! The yarn colour is perfect for something easy, breezy and fun! Sure is! I am making a beach type of cover. I also bought a magenta coloured dress in Malaysia that will be perfect with this yarn! it’s so exciting that you’re off to see the world with your entire family. I would love to be able to do that all the time. I don’t knit but appreciate those who do. This trip is everything I hoped it would be and so much more. I have really loved it. Each day is full to the brim! Awesome, thank-you so much! Knitting is easy to learn and fun to practice, so you eventually get better. Try watching the beginner youtube videos to get going and then find a yarn store. Those ladies are always so generous! Christine Westermark,thanks for the article post.Really thank you! Great. Oh how I love knitters and yarn sellers! The generosity of spirit in our community is so heart-warming. And now I’ve bookmarked the Buffalo Wool Company website! I got on a knitting kick over a decade ago, and haven’t knitted for around 9 years now, but have TONS of yarn. Although I find knitting meditative, let’s just say it isn’t one of my talents! Shari – I’ve given away most of what I have knit over the years! Right into the donation pile. A few special things I have kept. And with a lot of practice, I got good at socks, so that is a nice thing! Creativity is important for everyone is my opinion. A hobby or art it is what you make of it. Surrounding your self with the media of your interest is inspiring. Not all creative outlets have to return a profit. A lot of people just don’t get that, but artists certainly do! I agree! Surround yourself with your media. As I sit here typing away, my knitting project is right beside me. Patiently waiting, inspiring and yielding a personal profit to me that money cannot buy! I love to make afghans so when I crochet that is what I produce. I have tried to knit a number of time over the years but can’t seem to get the knack for it. Funny – I’ve tried crochet and struggle with tension! I suppose it all comes down to which one do you want to spend the most time with! I love this. I think it’s Ann Hood the novelist who lost a child and knitting became her solace. We all need something that speaks to the heart. So now I sit at my keyboard and write. It’s my knitting, I guess.